What Might Site-Specific Soil Standards for PFOA Look Like? The State of New Jersey recently adopted what is currently the lowest drinking water quality criteria (maximum contaminant level or MCL) in the country for perfluorooctanoic acid (PFOA) at 0.014 µg/l or 14 parts per trillion (ppt). This MCL is a health-based value developed by the New Jersey Drinking Water Quality Institute and is significantly lower than the 70 ppt health advisory level for PFOA put forward by EPA in 2016. Developers of the NJ MCL considered both cancer and non-cancer toxicological effects (in studies looking at exposure of rats and mice) and came up with the same result from both effects. In accordance with NJAC 7:9C-1.7, NJ MCLs become the groundwater quality standards. All aquifers are assumed to be used for drinking water unless specifically classified otherwise. This raises the question, with such low allowable levels in water/groundwater, what does this mean for cleanup of PFOA or other similar compounds in soils? New Jersey and many other states set soil to groundwater cleanup criteria for soils based on partitioning equations. Consequently, soluble/mobile compound cleanup levels in soil can be quite low. While criteria has not yet been adopted for PFOAs for site remediation, development of such a standard would be a necessary component of soil remediation. Using the partition equation and a conservative partition coefficient value of 115 l/kg, the generic soil remediation standard for PFOA in NJ would be 0.7 µg/kg (700 ppt). It’s easy to foresee the practical incompatibilities with soil cleanup levels in the part per trillion range. Even the much higher 5 ppb soil to groundwater cleanup levels for many mobile VOCs in NJ are difficult to achieve in many remediation scenarios. If achieving generic cleanup standards is not practicable or comes with excessive costs, we can use one or more NJDEP-approved ways to develop site-specific soil to groundwater cleanup criteria. So the question of PFOA cleanup levels in soil make for an interesting test case to look at how site-specific conditions might (or might not) affect soil cleanup levels developed by different methods. The simplest method is to use the same partitioning equations NJ uses to develop its criteria but with the addition of site-specific data, most importantly the total organic content (TOC) of the soils. TOC is the primary controller of partitioning of organic chemicals between the solid and liquid phase. 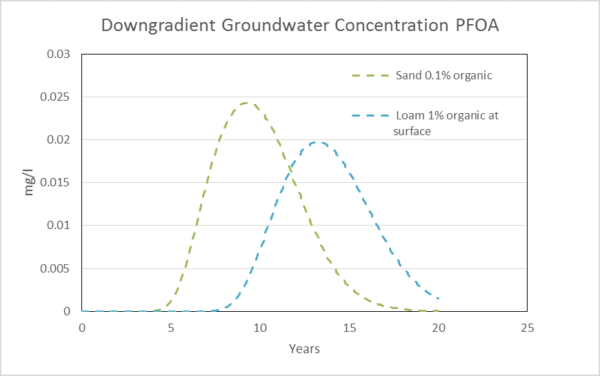 If, for example, you increased TOC from the default 0.1% to 1%, typical of a topsoil, the soil to groundwater remediation standard for PFOA would increase by almost an order of magnitude of 3 µg/kg. It’s also possible to directly measure partitioning in site soils using the Synthetic Precipitation Leaching Procedure (SPLP). This method is most often used with less mobile compounds, but even for mobile compounds, like chlorinated solvents, it can provide documentation of a site-specific standard an order of magnitude or so above generic levels; provided you can find soils in appropriate concentration ranges. Obviously, we can’t perform SPLP tests as part of a desktop exercise; however, it’s worth noting here since PFOA is typically present as an anion; other factors beyond organic carbon concentration can have some impact on partitioning. While some studies indicate that TOC is the dominant factor in partitioning, literature values for PFOA partition coefficient vary by several orders of magnitude. This suggests that performing SPLP testing may be a productive option to obtain site-specific information on partitioning behavior, which may demonstrate higher soil to groundwater cleanup criteria. Lastly, there is guidance for developing alternate standards with modeling software. Modeling methods can incorporate the widest variety of site-specific considerations and so may produce the highest values for site-specific standards. In NJ, modelers can either use SESOIL on its own to estimate transport through the unsaturated zone and the resulting maximum aqueous concentration of a compound present in leachate, or modelers can use AT123D to model groundwater transport to define the area that will exceed groundwater criteria and how long it will take to achieve water quality standards. Starting with SESOIL, let’s look at a simple scenario with a 0.1 mg/kg concentration of PFOA in surface soils. This could represent a variety of scenarios such as atmospheric deposition or application of bio solids containing PFOA. Simply using the partition equation, assuming a typical conservative 0.1% TOC would suggest an aqueous concentration of around 0.4 mg/l PFOA in the unsaturated zone. Using SESOIL in a site-specific scenario with 20 ft sandy soil column results in a lower maximum leachate concentration than indicated by the partition equation; around 0.1 mg/l as shown in green in the plot below. 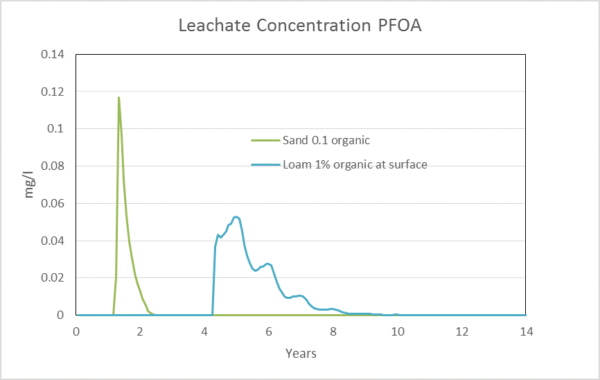 A loamy soil texture and 1% TOC at the top of the soil column slows down unsaturated zone transport even more, spreading leaching of PFOA out over the course of several years and brings the peak leachate concentration down further to about 0.05 mg/l (as shown in blue). This consideration would increase the allowable soil concentration and decrease remediation efforts. Once entering the saturated zone, there will be further dilution due to mixing which is dependent on the size of the source area and aquifer properties. Just as an example, let’s use AT123D to model groundwater transport for a 300 ft by 300 ft source area, a receptor 300 ft from the source and relatively high hydraulic conductivity and gradient. For the two scenarios presented above, dispersion dilutes the leachate concentrations down to around 0.02 mg/l in both cases. Groundwater concentrations are similar in both cases because contaminant mass flux remains the same in both scenarios and the mass loading is just spread out over a slightly longer time frame when unsaturated zone transport is slower. When the partition equation, or SESOIL alone, is used to derive soil to groundwater standards, dilution in the saturated zone is accounted for using a Dilution Attenuation Factor (DAF). In NJ, the accepted default DAF value is 20. For the scenarios above, the AT123D model predicts less dilution of the starting leachate values. So in this case where distance to a receptor is similar to the source size, the modeling performed with AT123D does not provide a higher soil to groundwater remediation standard; although it may serve other regulatory purposes. So how can we know when site-specific modeling will result in soil to groundwater standards that are substantially higher than those provided by partition equations? If site TOC is unusually high, or SPLP analysis indicates a higher partition coefficient, higher cleanup levels may be justified. Likewise, distances to receptors (or in NJ the down gradient edge of a Classification Exception Area (CEA)), which are large in proportion to the source size, may experience greater than the 20x dilution provided by the DAF. In summary, under some site conditions a more detailed analysis may move the decimal point to the right on the generic soil to groundwater cleanup standards that would be predicted for PFOA. If you are trying to protect groundwater quality close to a source area, as is most often the case in NJ, the soil to groundwater cleanup levels provided by partition equations are a pretty good place to start. And unfortunately, it’s likely that the soil to groundwater cleanup levels for PFOA really are going to be that low. If you have any questions, please feel free to contact either Nick Santella (nsantella@bstiweb.com) or Tripp Fischer (tfischer@bstiweb.com). Posted on January 22, 2018 January 25, 2018 Author BSTICategories Field Services, Remediation, Scientific Research & Problem Solving, Shared Expertise, Technical WritingTags cleanup standards, drinking water quality, Leachate, Maximum containment level, MCL, New Jersey, New Jersey Drinking Water Quality Institute, NJ, NJAC, NJDEP, PFAS, PFOA, remediation, SESOIL, site specific, soil standards, SPLP, synthetic precipitation leaching procedure, TOCLeave a comment on What Might Site-Specific Soil Standards for PFOA Look Like? I outlined before what makes a great guidance document, but that doesn’t automatically make the guidance a rule. Guidance documents which standardize a set of procedures are typically not only relevant, but may even be required by policy or law. Federal law and policies, such as the Office of Management and Budget Circular A-119 (revised January 2016), even require federal agencies to refer to standards by “incorporation by reference” rather than recreating the material in federal code. In such cases, these “Voluntary Consensus Standards (VCS)” become law. A-119 expands not only on the federal government’s reliance on VCSs, but also encourages participation in the development process. A-119 also requires that VCS’s which are incorporated by reference be developed in an open and balanced system and be considered for the costs associated with accessing the documents. Some standard development organizations, such as ASTM, have made available such referenced standards free to the public. State and local regulatory agencies may also rely on industry guidance documents in their corresponding regulations. Most do not have policies or procedures regarding incorporation by reference, so it is imperative that these documents be reviewed during promulgation or when the public has an opportunity to review and comment. Regardless of the referring agency, complications may rise when these documents are not updated or where references included in those documents are out of date. Finally, industry guidance may be written to support federal, state or local regulation but not necessarily referenced in the regulation. These may be state guidance documents, industry documents, or even peer-reviewed journals. Although not rule by reference, these documents sometimes become the “common law” simply by widespread industry acceptance. Users of these documents should be aware of their limitations, the process in which they were created and the frequency in which they are updated. Although useful for potentially predictive outcomes, these documents may be flexible and or open to challenge. Guidance becomes the rule when either regulatory agencies refer to them in such a way or when widespread acceptance makes them the norm. As you can imagine, the three categories listed above are not listed by importance. Informational documents are somewhat flexible in their usage while those that are referenced by law are not. The resources which go into developing guidance documents are sometimes astounding. I have estimated the costs of human time, travel, and resources on a key industry document for which I had a leadership role and my estimate was very near $900,000. I was probably low. With this amount of resources, the whole project should start with the conversation of significance. Then, make sure the concept stays throughout the document in a very concise manner. The significance is simply why the document is important and what problem it is trying to solve. Many of the great guidance documents have that one set of tables, charts, figures, appendices, or matrices that make it a great resource. You pick them back up knowing exactly where you are going to go in it. The bad ones you look at as 100 pages of words and just go “ugh”. The resource also must be current or the user must know if the material has the potential to be out of date. Relevant and useful figures make a big difference in the quality of a resource. Understanding the criteria listed above will help any user understand the applicability of an industry guidance document. More importantly, if starting one, this list provides a good starting point from which to base future discussions.